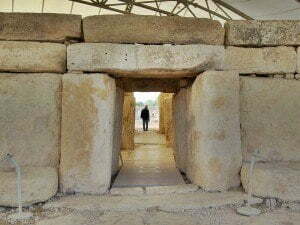 The first temple complex in the Hagar Qim and Mnajdra Archaeological Park are the Hagar Qim Temples. As with the other Maltese temples, the main entrance to the temple was placed in a concave façade. Unlike the other temples, on the other side of the temple there is a second concave façade with a second entrance flanked by the usual large blocks of limestone. This large, well preserved megalithic structure, built between 5,600 and 5,200 years ago, is flanked by the remains of two other structures. As with the other megalithic temples on the island, Hagar Qim Temple is internally divided up into semi-circular chambers or apses. In one of these, one of the wall blocks has human-made elliptical hole. At sunrise on the summer solstice a beam of light passes through this hole and illuminates a slab of stone inside the chamber. Today the temples are covered by a very visible white tent-like canopy. As distracting as the cover may be, it has been installed sensitively and can be removed. As the temples originally had roofs and then lay partly covered by soil until they were fully excavated in 1839, the exposure of the limestone blocks to the harsh coastal elements is not doing the continued preservation of these monuments any good. The temples of Hagar Qim and Mnajdra are about five hundred metres apart, in the Hagar Qim and Mnajdra Archaeological Park. Admission to the park includes entry to the Hagar Qim Temples, the Mnajdra Temples and the Visitor Centre. The facilities are located at the entrance to the park. Where are the Hagar Qim Temples? The Hagar Qim Temples are close to the entrance to the Hagar Qim and Mnajdra Archaeological Park, on the rugged, southern coastline of Malta. Two decorated stone blocks were found during the excavations of the site. On one there is a set opposing spirals, and the other was decorated on all four sides. Replicas now stand in their place. Also, it was here that the so-called ‘Malta Venus’ was found, along with anumber of other stone and clay figurines. The decorated blocks and the figurines are now on display in the National Museum of Archaeology, Valetta.